Literal translations frequently take much of the personality and poetry out of original texts, replacing carefully chosen words with stiff, inappropriate or even incorrect text. While global technology means app-makers have the potential to reach audiences in every corner of the world, the complicated process of localization often prevents them. Hoping to solve this problem, Colatris is a live platform which lets companies request and alter translations on demand, ensuring that localized content retains the energy, humour and emotion of their original app. The market for non-English speaking mobile apps is projected to quadruple over the next three years. Companies hoping to access this growing audience can use Colatris by inputting two lines of code into the back-end of their app. Next, they select which languages they want to support and watch as Colatris’s bilingual team members offer and review translations within the live platform. Once they are happy with the results, they can make their app available in new territories immediately. 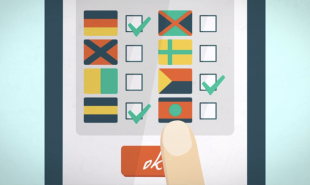 Are there other simple ways to adapt existing apps for global audiences?